RebeccaBlackOS is a Debian Testing-based live distribution that offers a developmental view ofWayland-based Linux desktop sessions. RebeccaBlackOS lets you test out the developing capabilities. As such, I will treat the distro release as a standard Linux Picks and Pans distribution review. The focus this week is a change-of-pace look at something new. The distro — as well as Wayland itself — is not yet ready for prime-time consideration. RebeccaBlackOS offers a sampling of Wayland and several new desktop shells to run on it. One of them is the 5 Hawaii Desktop. Weston so far is being touted as the default desktop shell for Wayland. This is the reference implementation of Wayland compositor written by Wayland developers. A few separate teams of developers are working toward a compilation of releases running Wayland and its related Weston compositor. One such plan is by a developer who goes by the handle “Nerdopolis.” He is the brains behind RBOS. 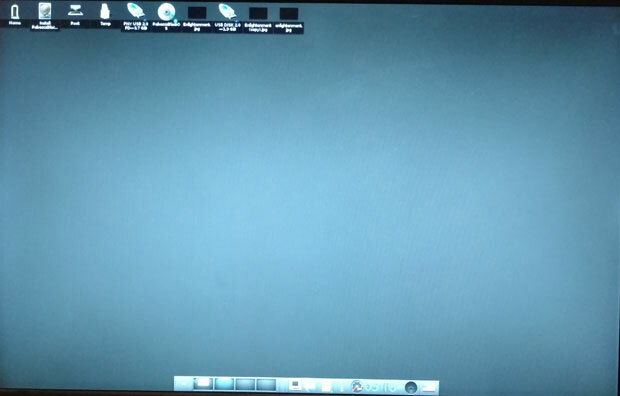 His distro attempts to showcase Wayland running several desktop environments that load by selection when you log in to Wayland’s display manager. 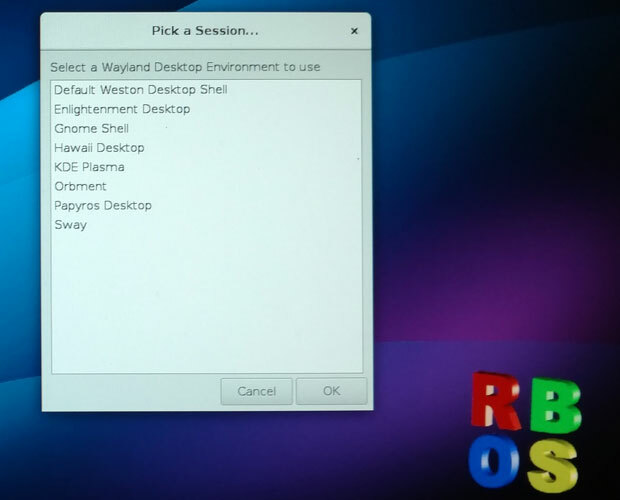 When the RBOS distro running Wayland boots, users select their preferred desktop environment. The RBOS release is available in 32-bit and 64-bit builds for the x86 architecture. It features the Weston desktop shell, Enlightenment Desktop,Gnome 3, Hawaii Desktop, KDE Desktop, Orment, Sway and the Papyros Desktop on Wayland. Wayland is a new display server slowly getting ready for release to Linux distributions as an alternative to X.Org. Development is bogged down on getting functionality to support the majority of user interface toolkits — GTK and Qt and such. Wayland is software that runs between the input and output to coordinate the on-screen display. It handles the directions from mouse input and windows behavior control buttons and provides the needed interaction between the Linux user and the GUI to keep the operating system humming along. Why the change? X.Org is several decades old. It has been adjusted and tweaked beyond its capabilities, according to developer communities. They want to throw out the old and bring in the new to avoid compounding existing bugs and security holes that no doubt lurk within. One of the primary forces behind the development push for a change isCanonical, the developer of Ubuntu Linux. Its software engineers have been struggling to get the kinks out of their own version of an X.Org replacement dubbed Mir, which they forked from Wayland. Depending on your hardware, RBOS may not run some of the desktop environment options listed in the display manager menu. I had varying degrees of success on my combination of six test laptop/desktop computers. For example, RBOS loaded Gnome, KDE, Enlightenment and Weston on several computers. The other desktop shell options could not load on any computer because modules were missing from the ISO, according to error messages that flashed briefly on the computer screens. The Enlightenment Desktop running on Wayland is smart and fast and fully functional. I found the most usable results with running KDE, Enlightenment and Gnome. Those desktop environments have a more complete — but still limited — collection of applications. The Gnome experience was the most satisfying. That is a surprising admission for me to make, as I generally do not prefer the Gnome 3 shell environment. I also was very intrigued with the Weston shell environment. It offers a much different look and feel compared to the other desktop options. Weston is the only desktop environment in the mix with which I had no prior experience. As a result of that intrigue, I am focusing on my first impressions of Wayland/Weston for the rest of the review. This newest release incorporates the latest GTK, Qt, SDL2 and Enlightenment code with Wayland and Weston Compositor support. The most significant change in the latest release of RebeccaBlackOS is that Debian Testing now runs Tier 1 packages to comply with Canonical’s new licensing requirements for Ubuntu. The system installer is Calamares. The Linux kernel is version 4.3. The ISOs are EFI bootable. You can boot the live session DVD on Macs if you use rEFInd. In case you’re wondering, the distro’s namesake is a singer best known for the viral video for the song “Friday.” No, the distro does not contain any of her music. Weston’s screen design is straight out of classic Linux, until you start clicking launchers anchored on the panel bar at the top of the screen. The Wayland app launcher icon in the far left corner opens a window in random locations on the screen. That window has a familiar KDE look to it with a search window at the top and a list of application categories in the center. Many of the apps are from the KDE inventory. Clicking on the carrot to the left of a category expands a list of apps in that category. Highlight the app name to run and click the OK button at the bottom of the window. The launchers include the Dolphin File Manager, rekong Web browser, terminal window, KDE video mixer, network configuration tool, Weston video converter, power dialog and information. It’s obvious that the menu system is more of a holding vehicle than a fully functional launcher. Many of the settings apps and applications did not load, presumably because they were not yet available on the ISO. Overall, the Weston user interface is uncluttered and easy to follow. The Wayland/Weston combination produces an uncluttered desktop view with a simple user interface. RBOS gives you enough stability to play around with a variety of user interfaces. It’s encouraging that KDE and Gnome 3 shells work so well already on Wayland. The Enlightenment desktop is one of the newest innovations available on several Linux distros, so it should continue to attract interest running so well on Wayland. The KDE shell environment runs smoothly on a Wayland build with full functionality. The Weston shell seems to need a lot more work, but it shows promise.